GREAT FALLS, MONTANA. At first glance, it could be most any small city in the West. Wheat farms and steak houses, strip malls and car lots. But as you pull into town from the west, Square Butte hazy in the distance, the landscape feels … familiar. Hard to put your finger on it. But then maybe the clouds shift a little, maybe the colors brighten in just such a way. A horse trots along a fence line. And there it is: Charlie Russell. This is Russell Country, in Chamber-of-Commerce speak. It’s where Russell had his studio and home, where he lived and passed away, and where he drew a good measure of his inspiration. 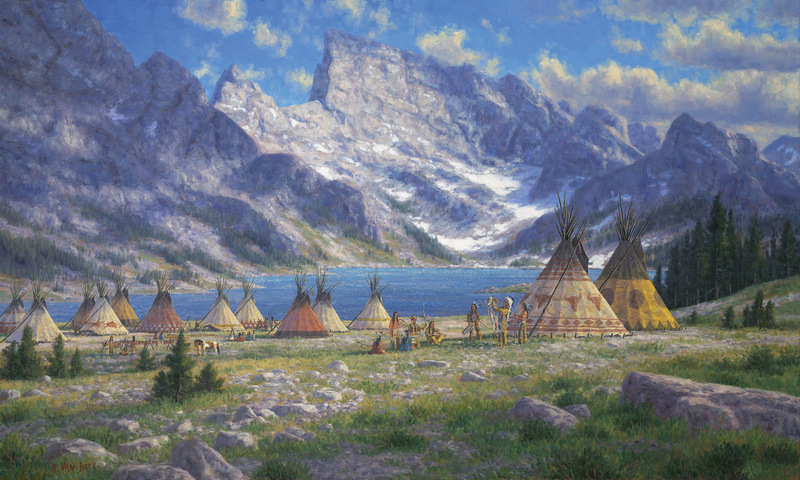 Square Butte provided the backdrop for some of his more famous paintings. When Russell died, he was perhaps the most highly paid artist in the country. Certainly, one of the most popular. And thanks to Russell’s ongoing presence, due largely to the flourishing of the C.M. Russell Museum on 13th St. North, for the last 45 years, and always around Russell’s birthday on March 19, Great Falls is briefly the cynosure of Western art in America. 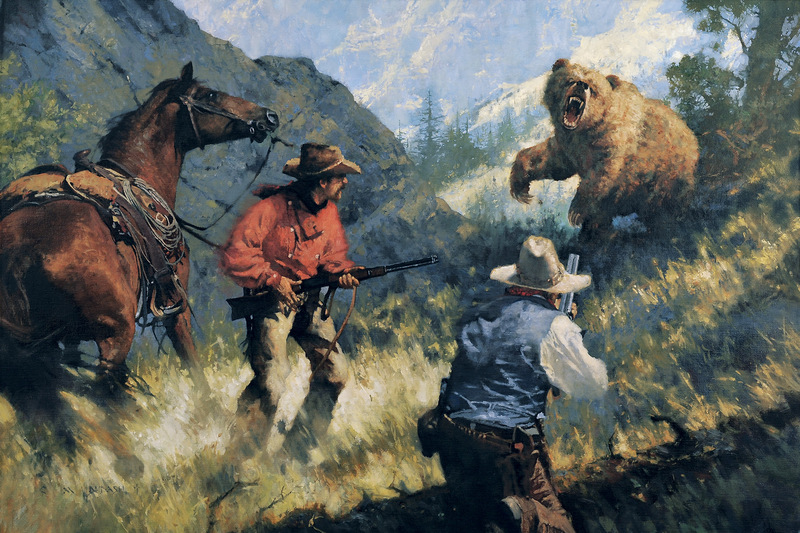 During the annual Western Art Week, the simmer of Russell enthusiasm hits a boiling point and tips off the lid. 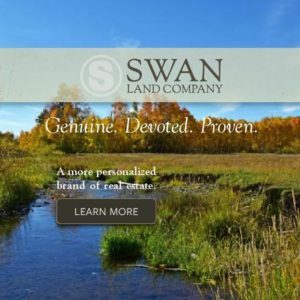 The town is taken over by Western and wildlife painters, sculptors, woodworkers, gallery owners, collectors, and enthusiasts. There are traffic jams getting into the Out West Art Show and Sale at the Heritage Inn, a location where more than 140 artists and galleries exhibit in motel rooms. 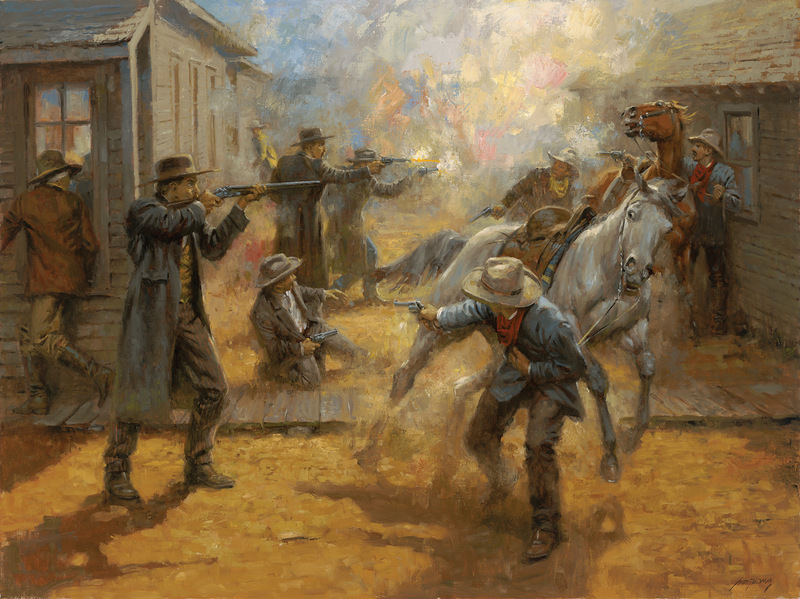 There are quick draw events and live auctions, wine tastings and educational lectures. 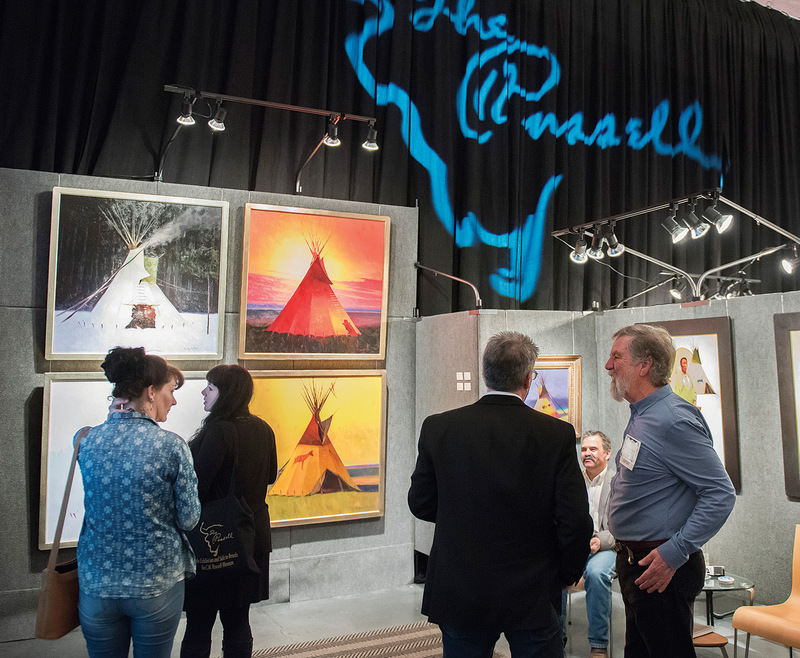 But the signature event of the week is The Russell Exhibition and Sale to benefit the Charles M. Russell Museum. Probably fair to say that this auction is the hinge around which everything else swings. Back in 1969, the exhibition was the specific occasion that seeded Western Art Week. 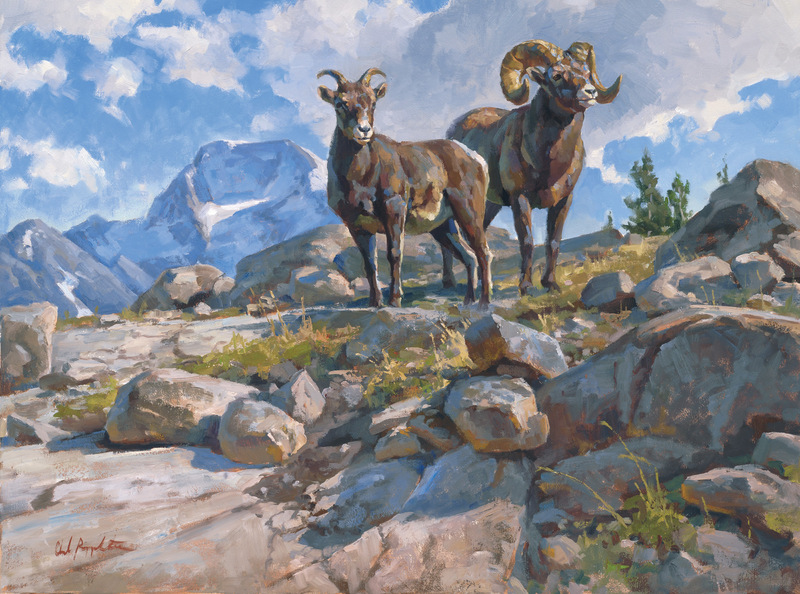 For an aspiring Western or wildlife artist, these days it’s not a cinch to even find a place in the auction. In 2016, more than 900 artists applied for what ended up being 230 lots. To be chosen for inclusion in the auction, therefore, is something of an honor. And within this elite group, there is an even smaller group of artists, a privileged few hand-picked by the museum to receive greater attention from the museum and the auction. 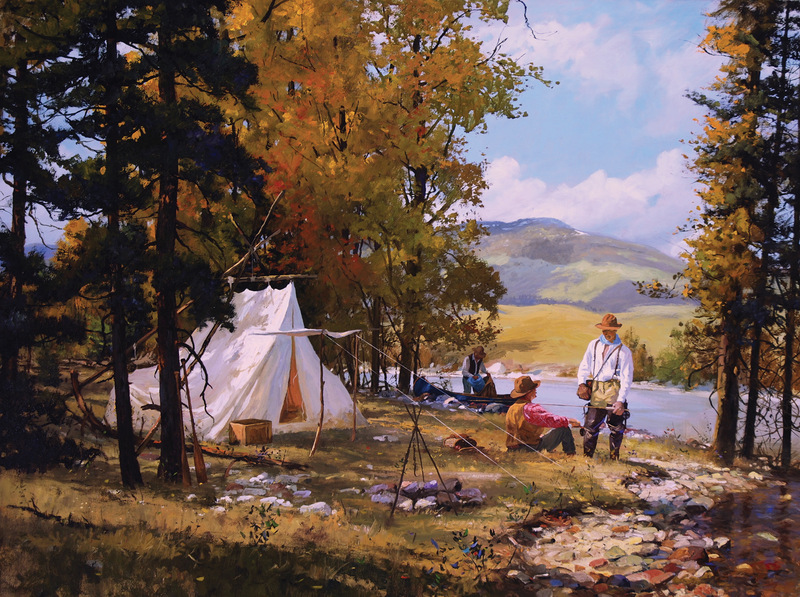 Founded only three years ago, the Russell Skull Society of Artists is an honor society meant to simultaneously shine a spotlight on a handful of truly exceptional Western artists as well as provide benefit to the museum, the auction, and the legacy of Charlie Russell. In 2016, there were 22 member artists, each one chosen by a committee made up of Charles M. Russell Museum board members and patrons. 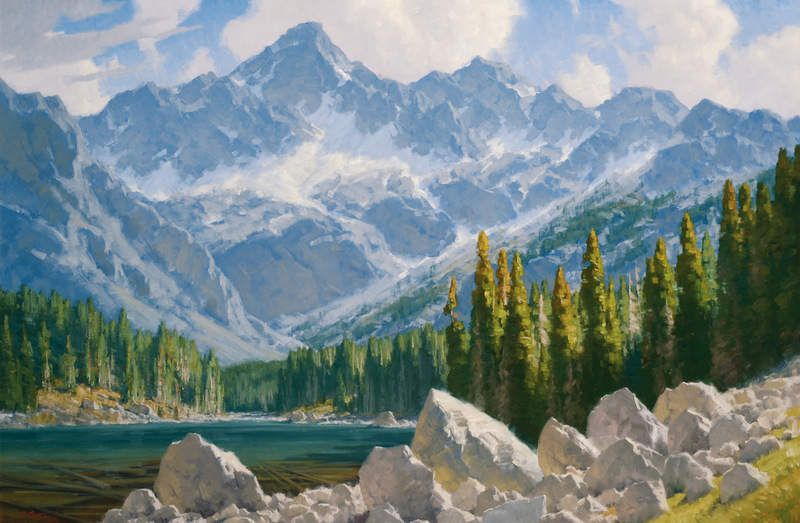 The artists, from R. Tom Gilleon to Oleg Stavrowsky, Charles Fritz to Nancy Cawdry, come to the Skull Society from a variety of backgrounds and regions. 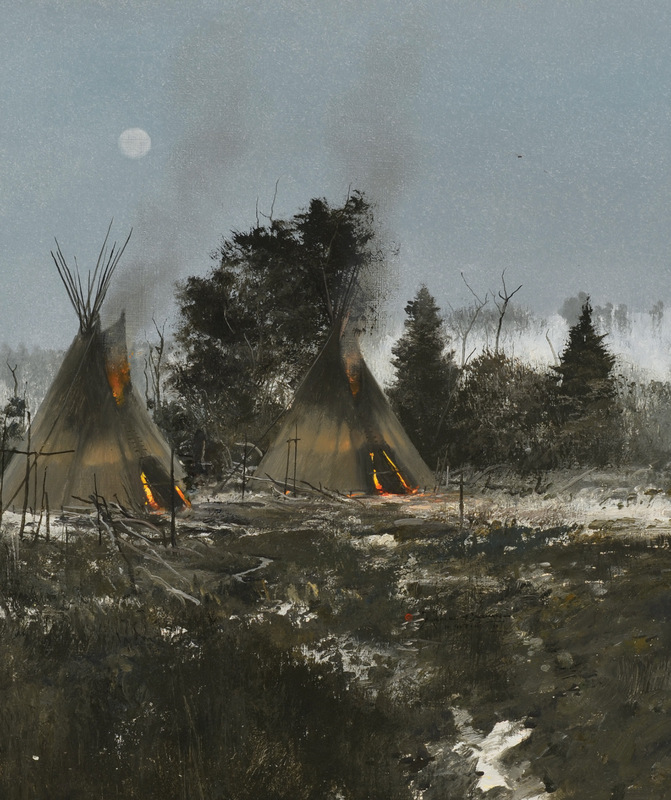 Each one, in his or her way, has been deemed to “celebrate the themes and traditions of Charles M. Russell.” The membership reads like a dean’s list of esteemed Western artists. This honor roll (if you will) was chosen based on four criteria: 1) service to the C.M. 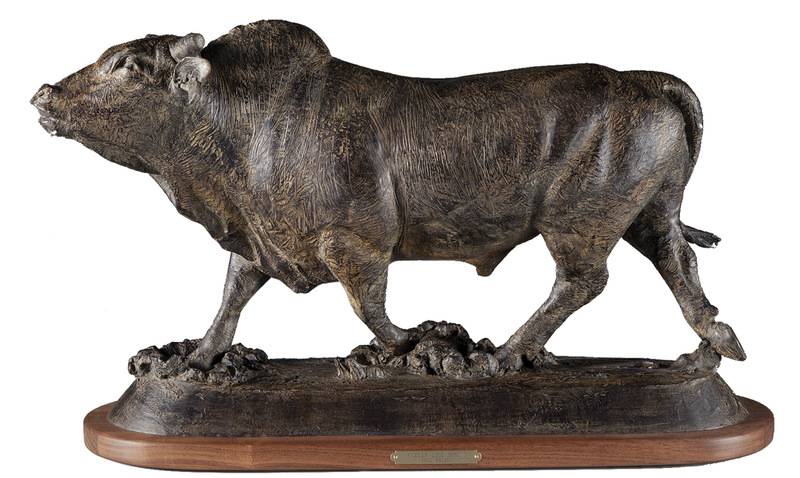 Russell Museum; 2) history and strength of sales in The Russell Exhibition and Sale; 3) artistic accomplishments as demonstrated through exhibition history and awards; 4) willingness to submit their best work to The Russell Exhibition and Sale. Once chosen, Skull Society artists are also asked to sign off on a membership code, an agreement that stipulates rules of behavior (in a nutshell — don’t do anything that will reflect badly on the museum). In return for their membership, for appropriate conduct, and — perhaps most importantly — for supplying their best works to the museum for auction, artists receive premium booth placement in the Mansfield Center for the Performing Arts, the pivot of the museum’s events. They receive exceptional coverage through museum marketing and publicity. And by virtue of the attention paid to them, they receive greater access to collectors and buyers. Given the scramble for attention that seems to be one of the unfortunate hallmarks of Western Art Week, this stamp of approval seems, in and of itself, to be something of extraordinary value. Membership is fluid, and renewed annually. Artists can leave, and artists can be added. According to Michael Duchemin, executive director of the Charles M. Russell Museum, the Skull Society was the brainchild of Steve Whistler, a former chairman of the Trigg-C.M. Russell Foundation. “I started work in May of 2013,” Duchemin said, “and one of my first tasks was to create this society.” The idea arose, at least in part, as a way for the museum to reach the next generation of collectors and buyers. “We share a concern with the artists that if we don’t continue to make Western art relevant, we risk losing our audience. 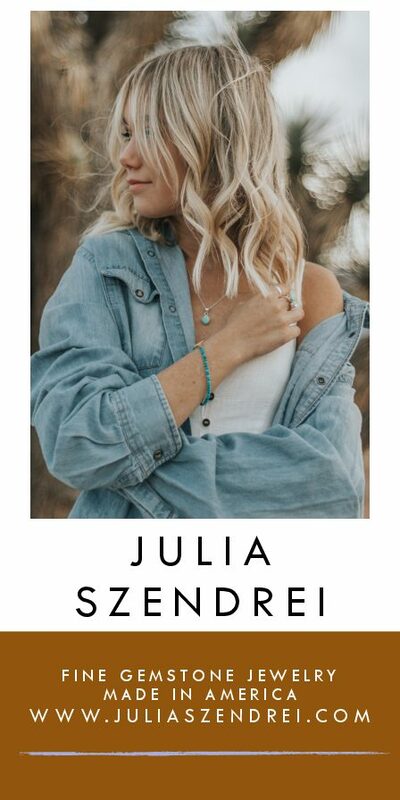 Russell Skull Society is a conscious effort on our part to try and develop new audiences.” The Skull Society is also somewhat a work in progress. “Our goal is to develop it into something more substantial and meaningful for the artists as we work to continue Russell’s legacy,” Duchemin said. In addition to the obvious benefits to the museum and the artists, a good case could be made that the Skull Society puts a unique spotlight on the continuing influence and legacy of Charlie Russell himself. Russell wore any number of hats as an artist; it’s an aspect of his genius. And through the Skull Society, even 90 years after his death, there is occasion to revisit the range of his abilities and interests. Having all these artists in one place amplifies the point. 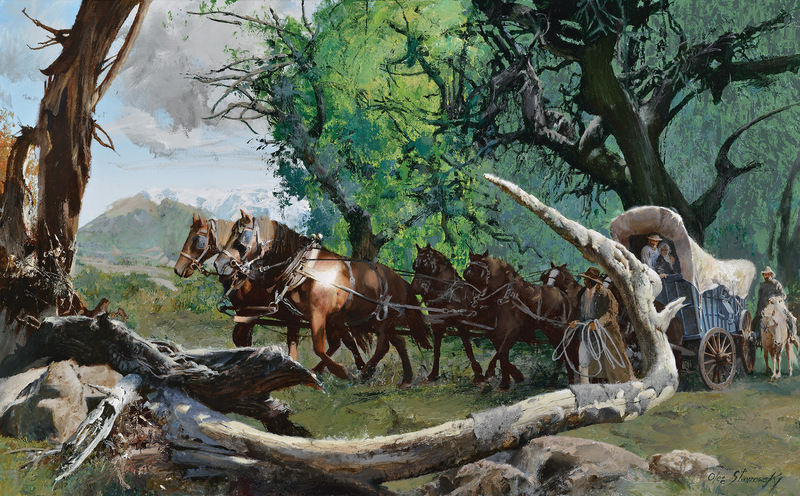 In Fritz and Stavrowsky, C. Michael Dudash and Gary Lynn Roberts, and Andy Thomas (indeed, in most all the artists), there are aspects of Russell’s love for narrative, for catching a single moment that points in turn toward a larger tale. 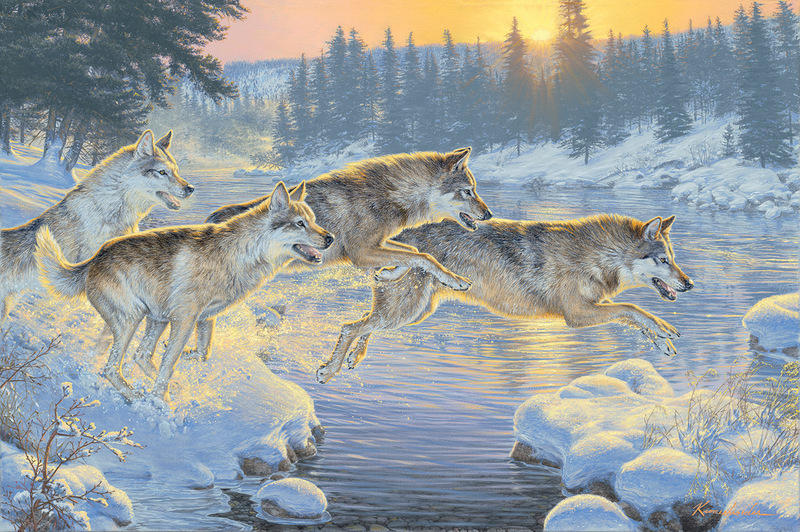 In Chad Poppleton, Lee Kromschroeder, and others you can see Russell’s love for wilderness and wildlife. 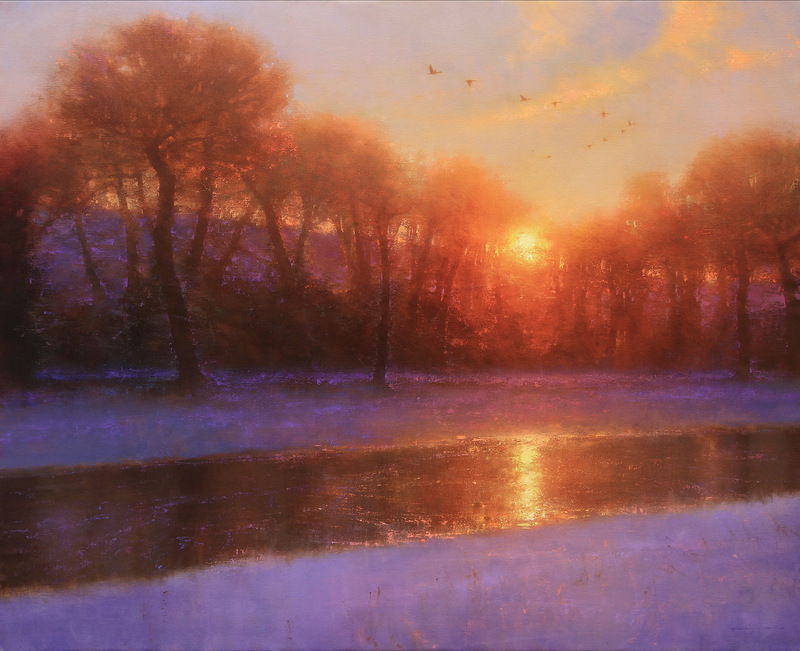 In Carol Hagan and Nancy Cawdry, you can see the bright colors of Russell’s later paintings, albeit exaggerated through their signature styles. 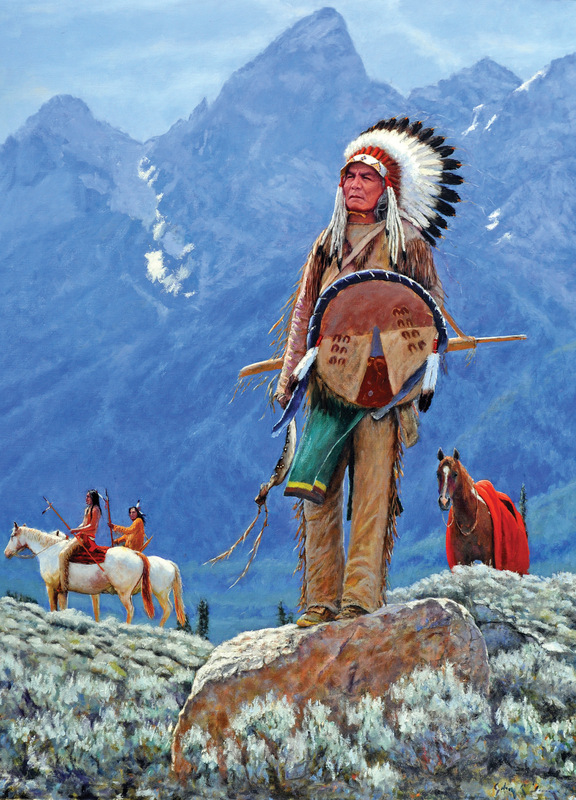 In R. Tom Gilleon, Steve Seltzer, Randy Van Beek, and Todd Connor, you can see his near-elegiac appreciation for Native people. With bronze artists Greg Kelsey and Jerry McKellar, Russell’s affinity with sculpture. And throughout the array of works, you can see aspects of Russell’s whimsy, his humor. 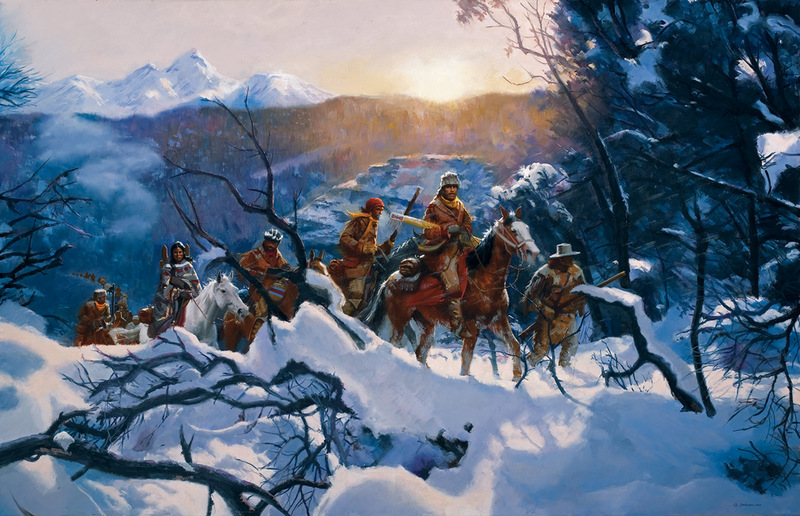 There is even the occasional nod toward journalism — the recording of an important moment — that lies behind pieces such as Russell’s famous Waiting for a Chinook. Russell had a fondness for the moment of repose as well as the arrested moment of pandemonium. He was equally adept at bucking broncs and thoughtful stares off into the distance. And it’s all somehow here, in a cloth-draped auditorium in Great Falls, Montana. 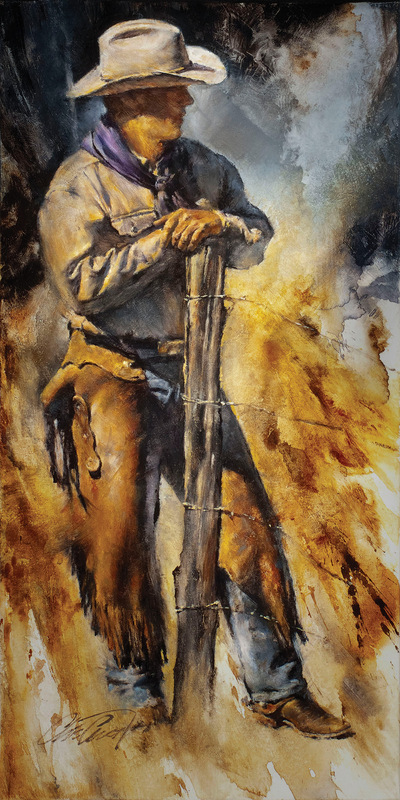 Coming out the narrow end of Western Art Week, a little worn out with small talk and networking, it’s a temptation to consider what Russell himself would have made of the hullabaloo. You wonder if he wouldn’t be a little skeptical. But spending quality time in the Mansfield Center, perhaps in the afternoon during a moment of pause — the auditorium empty save for one or two artists in their booths — as you leisurely move from one display to the next, you can feel the fatigue evaporate. 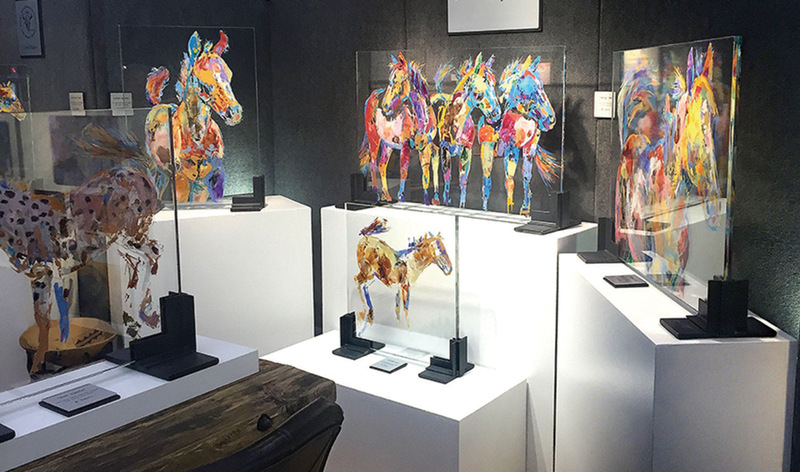 As you consider these extraordinary masterworks, painting after painting, sculpture after sculpture, all this exceptional work corralled together into one room, it’s impossible not to feel a measure of rightness about it all. In the end, you have to think it would have made old man Russell quite proud. Russell was (and continues to be) many things. But above all else, he was authentic. Boot heels to eyebrows, he was the real deal, and fiercely so. All these years later, I believe it’s something he’d have in common with the artists of the Skull Society. 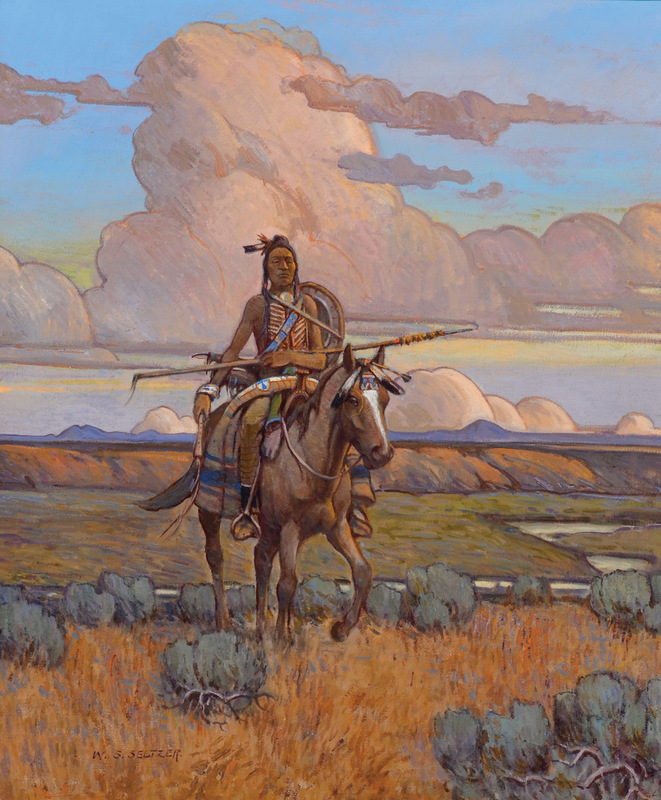 The Mansfield Center for the Performing Arts in Great Falls, Montana, serves as both auction site for The Russell and display space for Russell Skull Society artists, including R. Tom Gilleon. 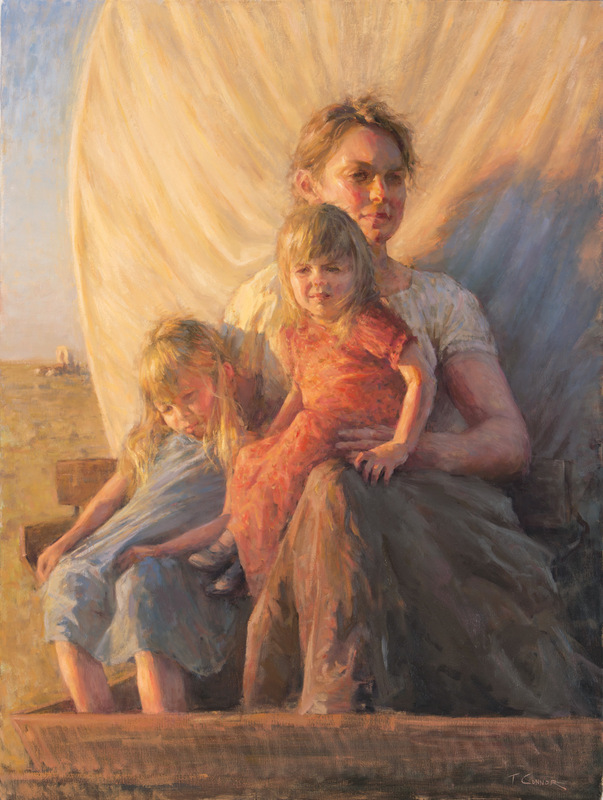 The Mansfield Center for the Performing Arts in Great Falls, Montana, serves as both auction site for The Russell and display space for Russell Skull Society artists, including Carol Hagan. 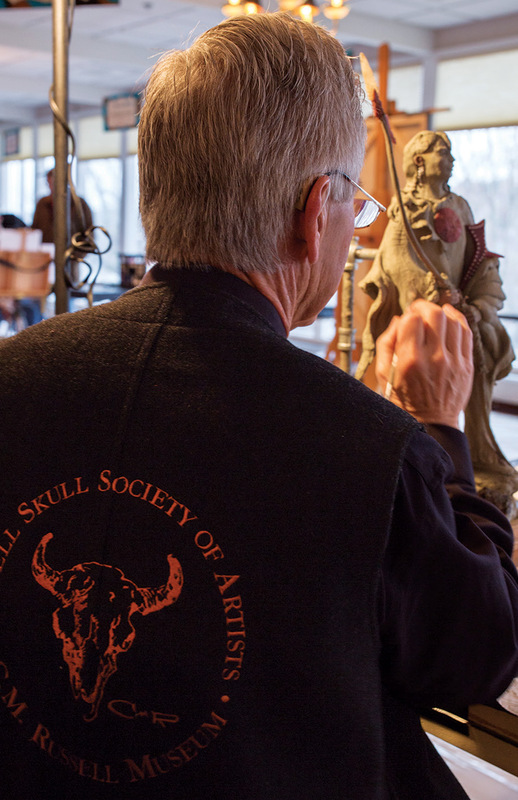 Sculptor Jerry McKellar, wearing a Russell Skull Society honorary vest, works on a piece during a Western Art Week quick finish event.